The perfect holiday or winter side dish, smoky HOFFY Bacon and a sweet, tangy drizzle of balsamic glaze enhance these beautiful Brussels. 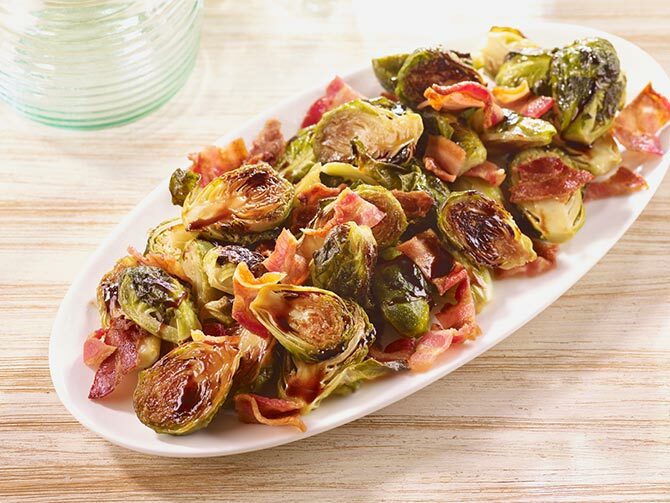 Combine the Brussels sprout halves, Hoffy bacon pieces and garlic on a baking sheet. Drizzle the mixture with the olive oil and season with a pinch of salt and a generous grinding of black pepper. Toss well to combine. Roast the Brussels sprouts until they are caramelized and tender, about 30 minutes, stirring once during the roasting process. To make the Balsamic Glaze, combine the balsamic vinegar, honey and thyme in a small saucepot. Bring the mixture to a boil, reduce to a simmer and cook for 10 minutes, or until thickened (the mixture should coat the back of a spoon). To serve, drizzle the roasted Brussels sprouts with the balsamic glaze.